As a New York real estate tycoon and casino owner in Nevada, Donald Trump’s management style was to keep his subordinates, competition, vendors, clients guessing, and spring surprises in meetings to have an upper hand. But it did not always work for him. His businesses filed for Chapter-11 bankruptcies six times. Trump’s ad hoc working style and blowing hot and cold unabatedly followed him to the Oval Office on appointments, domestic and trade policies, and foreign affairs. This style is bad for running the behemoth called the Government of the United States, whose tentacles in military alliances, intelligence operations, business/trading interests, are spread all over the world. So, managing US relations with allies and trading partners, and dealing with threats and enemies require a steady hand at the helm to diplomatically coordinate the policies. Thousands of dedicated government officials work for him doing the groundwork for months, even years, to build consensus on complex, sensitive issues, so that in summits, leaders can sign agreements on issues on substance under good optics. 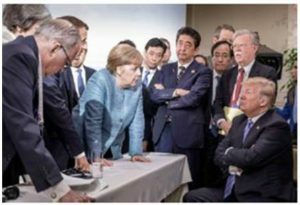 The other G-7 leaders confronting Donald Trump at the G-7 meeting in Canada in May 2018. Trump’s adhocism on policies makes it difficult, to put it generously, for officials to negotiate on his behalf. He erratically turns the rudder wheel of the huge ship of the State with bluster, as he did in the G-7 meeting in Canada in June. The confrontational picture describes the acrimony in the meeting. President Trump may think — even believe — that the brashly displaying American raw power in summits will make US allies genuflect before him and scare hostile nations into submission. The “Sole Super Power” sobriquet for the US will be honored by allies — and feared by enemies — only if the US uses its power with discretion and finesse. His bluster and bravado weaken the alliance, only making Russia and China happy. This entry was posted on July 22, 2018, 12:33 pm and is filed under July 2018, Past issues. You can follow any responses to this entry through RSS 2.0. You can skip to the end and leave a response. Pinging is currently not allowed.